Housed along the community’s nineteen acres of pristine landscaping and best-in-class amenities, the surrounding forest of towering oak trees gives Brezza apartment homes a distinctly South Austin feel. 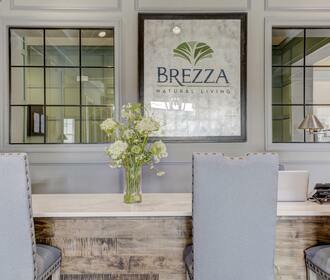 Each one, two and three bedroom home at Brezza pairs a grand layout with thoughtful, upscale features and an attention to detail unrivaled across other apartment communities in Austin, TX. From the natural look of the hardwood-inspired flooring to the clean lines of the frameless shower enclosures, each apartment incorporates designer finishes with you in mind. 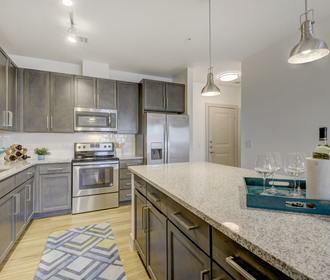 In your kitchen, the custom cabinetry blends the earth tones of the granite counters and the cool stainless steel finish of the Energy Star-certified Whirlpool appliances. 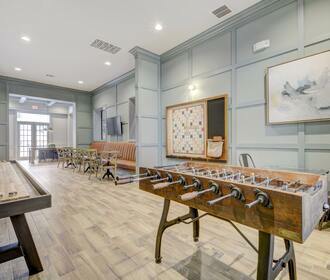 When you’re not exploring the four-acre park and nature trail, you can unwind beside the indoor and outdoor fireplaces or engage in some friendly competition in the game room. The easy access to Interstate 35 also places you near the area’s top employers, as well as shopping at Southpark Meadows. For more details, schedule a tour today.